Roughly a hundred of the former Holiday Inns have switched to Choice Hotels International, which includes Comfort Inn and Quality Inn, and another 120 have moved to Wyndham International brands such as Ramada and Howard Johnson. While those franchisees have thus avoided Holiday Inn's extensive renovation requirements, the new brands' rates are routinely 20% to 35% lower, making the hotels less lucrative. GREEN BAY, Wis.–Holiday Inn's sweeping upgrade includes stripping its brand from 700 franchisees, cutting loose hotels that are part of its storied past. For Doug Schubert, who has operated a Holiday Inn on the banks of the Fox River here for 34 years, the end will come Dec. 31. The next day, his 146-room hotel will begin operating under Choice Hotels International Inc.'s Clarion brand. He would have liked to stay with Holiday Inn, he says, but he couldn't afford the renovations and upgrades that were demanded by the unit of U.K.-based InterContinental Hotels Group PLC, which he estimated would cost $1.6 million. "I had to make a choice of going independent, going bankrupt or operating with a [brand] that is more reasonable as far as fees and costs," Mr. Schubert says. "My first desire is to sell, but the buyers aren't out there." Holiday Inn said it couldn't comment on Mr. Schubert's situation. 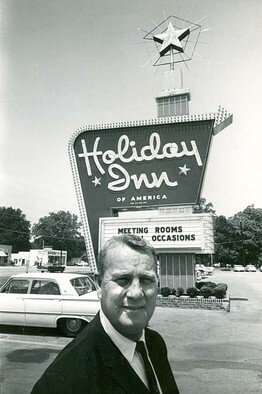 Mr. Schubert's hotel and several others stripped of the Holiday Inn brand have been with the chain since its early years under founder and Memphis developer Kemmons Wilson. But over the years, many Holiday Inn owners failed to make regular renovations as required by Holiday Inn, and, as a result, complying with Holiday Inn's minimum standards now would be very costly. On top of that, they would have to spend an average of $150,000 to $250,00 per property on required upgrades—new signs, new bedding, new shower fixtures and the like—as part of the chain's effort to become more upscale. Downtown here on a Thursday in October, Mr. Schubert's seven-story Holiday Inn was busy. At breakfast, it hosted the local Kiwanis Club, and in the afternoon, a women's bridge club settled into its spacious River Room restaurant. Meanwhile, installers and repairmen with LG Electronics met for a seminar in the hotel's meeting rooms. But the hotel looks dated. Its wallpaper has separated slightly at the seams, and its halls show stains and scuffs. It also still provides guests with 25-inch projection-tube TVs rather than newer flat-panel models. Nonetheless, the hotel ranks fourth in occupancy in Green Bay, charging roughly $70 a room, with revenue per room of around $40, Mr. Schubert says. The hotel's exit from Holiday Inn became a certainty when the chain required Mr. Schubert to make upgrades. Specifically, Holiday Inn demanded that Mr. Schubert stucco the hotel's concrete exterior and replace the furniture, carpet, bathroom tile, wallpaper and TV sets. It also wanted the hotel's restaurant and lobby redecorated. And it said he would have to take down the electronic marquee on the hotel's main sign, a hallmark of the Kemmons Wilson era, he recalls. The cost and scope of the renovations were too much for Mr. Schubert. He had exhausted the hotel's $500,000 reserve account for renovations to cover his operating costs during the recession. Though he met with several banks about borrowing the $1.6 million, he balked at the lenders' requirement that he personally guarantee most of the loan. So he listed the hotel for sale, asking $7 million last year and recently reducing the price to $5.5 million when he couldn't get offers he liked. In the meantime, Mr. Schubert has opted to switch to Choice's Clarion brand, which required only $300,000 in renovations and let him leave his lobby and restaurant relatively untouched. "Their emphasis is on comfortable beds and clean, modern bathrooms," he says. Roughly a hundred of the former Holiday Inns have switched to Choice Hotels International, which includes Comfort Inn and Quality Inn, and another 120 have moved to Wyndham International brands such as Ramada and Howard Johnson. While those franchisees have thus avoided Holiday Inn's extensive renovation requirements, the new brands' rates are routinely 20% to 35% lower, making the hotels less lucrative. Meanwhile, as hotels like Mr. Schubert's switch brands, a few owners of older hotels have stayed with Holiday Inn. Don Houseworth, who has owned a 156-room Holiday Inn in Blytheville, Ark., for 34 years, says that his hotel has benefited from the chain's upgrades, which he completed in 2008. Since then, he says, the hotel has posted an occupancy gain of 11 percentage points to the mid 60s and a $7 gain in its room rate to $87. Bryan Nearn, who has owned a 111-room Holiday Inn in Asheville, N.C., for 25 years, says upgrading his hotel helped soften the blow of the recession. He says he likes the new bedding and external signs, but not the new exterior lighting or lobby scents. Even so, he says, "history will prove they were right" to revamp the chain. 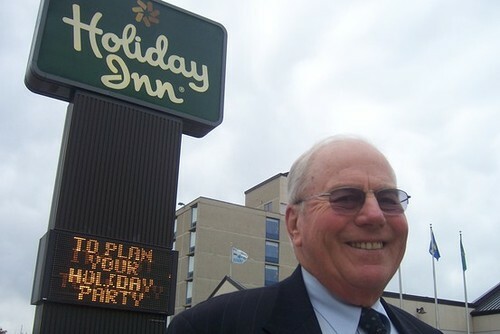 But the change is still tough for Mr. Schubert, whose association with Holiday Inn dates back more than 50 years, when, as a student at Bradley University, he helped manage a Holiday Inn in Peoria, Ill.
"I have a lot of years with Holiday Inn," Mr. Schubert says of his impending move. "I'd much rather stay if I could."